Mr. Mandela’s life was a lesson in convergence. As a prisoner on Robben Island, he struck up a friendship with the guard in charge of his care. As the first president of a post-apartheid South Africa, he brought whites and blacks together in government. He reached out to his fellow white citizens who were unsure of their place in the new society. And he was a steadfast advocate of the country’s Truth and Reconciliation Commission, setting a model for peace-building for generations. He guided his country along the arc of history, a slow journey toward unity and justice. Though former President Mandela was largely absent from the public square in the last years of his life, his very existence was a source of consolation for people in South Africa and beyond. Sadly, he leaves behind a world torn by the wounds of division. Democracy in South Africa suffers from growing pains. The absence of unifying leaders in Egypt and Iraq is achingly evident. Civil war in Syria raises a nagging question: Is the human family really evolving toward greater unity? Yet Mandela’s name, like those of Mohandas Gandhi and Martin Luther King Jr., offers hope that with God’s help, we may continue forward on our pilgrim path, waiting for another transformational leader to speed our march. Despite international pressure, the government campaign against gays and lesbians in Uganda continues; a law that would impose the death penalty for certain homosexual acts and levy heavy fines on groups that support gay rights remains on the legislative agenda. Meanwhile, gays living in Uganda must live in constant fear of discovery and prosecution. A British man and his Ugandan partner are now facing jail time after they were outed in a particularly cruel fashion. Condemnation from Western governments and media outlets have had limited effect. Local leaders in Uganda see homosexuality as a “scourge” exported from the West and greet international censure as confirmation of a larger pro-gay agenda. Sadly, some Christian pastors have been instrumental in the government’s campaign against gays. The Anglican Church has been more vocal in its criticism of the legislation, though some divisions remain among local leaders. A unique opportunity exists, therefore, for Catholic leaders to organize against the proposed law. Christian leaders exert unique influence in Uganda, and the centralized nature of the church allows for Catholic leaders to speak with one voice. Archbishop Cyprian Lwanga of Kampala spoke against the bill in 2009, calling it “unnecessary” and “at odds with the core values” of Christianity, but a more sustained and full-throated criticism of the bill is warranted. The Holy See, which has a good relationship with Uganda, can also play a more active role. Vatican diplomats should make it very clear that the continued persecution of homosexuals in Uganda is unconscionable and un-Christian. 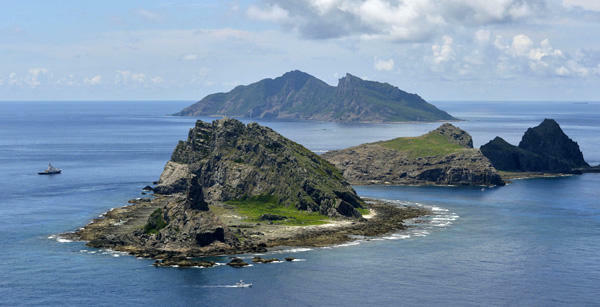 Called the Senkaku in Japan, the Diaoyu in China and an “uninhabitable pile of rocks” by many observers of geopolitics, a small chain of disputed islands is at the center of the latest round of brinkmanship over the East China Sea. On Nov. 23, China unilaterally declared the international airspace above the islands part of its Air Defense Identification Zone, demanding that all aircraft that enter the area notify Chinese authorities of flight plans or face “defensive emergency measures.” Though China’s move is within the bounds of international law, it is seen by its neighbors to the East as a provocative bid to strengthen its territorial claim to the contested islands. While the United States takes no sides in the territorial dispute, it has made clear that if China were to use force, U.S. treaty obligations with Japan would require it to defend the islands, which fall under Tokyo’s administrative control. The United States signaled its resolve to maintain the status quo in the region by flying unarmed B-52 bombers through the zone unannounced, and its ally Japan followed suit, sending in patrol planes in defiance of the new rules. This situation calls for serious pre-emptive diplomacy—not one-upmanship. Strong populist nationalism and deep historic grievances on both sides increase the risk of military miscalculations that could drag the United States into an unwelcome conflict with China. Vice President Biden has rightly called for “confidence-building measures, including emergency communications channels” to prevent such escalation. Both the White House and President Xi Jinping of China have embraced the idea of pursuing a new type of “great powers relations.” Navigating these troubled waters will be the first major test of this commitment. With all the acolades for Mandela there is a remarkable amnesia about his decision to embrace violence in his battle against racism. He pleaded to 256 crimes which involved bombings and killing of innocent women and children, this not to mention the necklacing terrorism setting people on fire by placing petrol-filled tires around their necks. Mandela was also a proponent and an introducer of legalized abortion in S. Africa hardly consistent with human rights for the most defenseless. I doubt there would be this collective amnesia by the world's press and the cognosecenti if these acts were done in favor of a cause the pc world would not approve of. The end does not justify the means Rom.3:8 is not a concern for the pc world. Yes indeed the Uganda law is an atrocity and should be opposed by Christians but the criticism of it should not lead to relativism or confusion about the homosexual acts nor should the terminology of the gay ideological movement be used which is also a child of relativism leading to harm to the human person. We shouldn't forget that Mandela was no champion of the West, the U.S. in particular. He believed that we were responsible for all the terrible things on the planet, to paraphrase his words. Why should he have been a champion of the West? The CIA assisted the apartheid government in his arrest. He owes no favors and knew who didn't help his cause. Mandela never claimed to be a pacifist. He was offered release in the 80's if he renounced violence. He would not. Given the venomous comments that appear here when pacifists blog, you would think Mandela would be approved. I guess you're damned either way when dealing with conservatives. Bottom line for me, he seemed to have transitioned South Africa without a lot of people white and black being shot and hacked to death. Quite an accomplishment. My criticism is that he allowed the constitution to establish corporate personhood and fell for all that pro-multinational neoliberal ideology. Maybe he had to, given their overarching dominance. This article also appeared in print, under the headline "Current Comment," in the December 23-30, 2013 issue.